Pan Am Flight 103 wis a regularly scheduled Pan Am transatlantic flight frae Frankfurt tae Detroit via Lunnon an New York. On 21 December 1988, N739PA, the aircraft operatin the transatlantic leg o the route, wis destroyed bi a bomb, killin aw 243 passengers and16 crew, in what becam kent as the Lockerbie bombin. 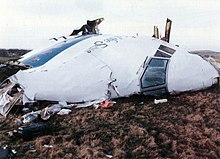 Lairge sections o the aircraft crashed ontae residential auries o Lockerbie, Scotland, killin 11 mair fowk on the grund. ↑ Several passengers war reportit tae have survived the ineetial impact, aw eventually dee'd efter the crash. ↑ "Lockerbie 10 Years On: The dead girl still had tufts of grass in her hand..she was conscious when they crashed; TERROR OF PASSENGERS WHO FELL SIX MILES WHEN PAN-AM FLIGHT 103 EXPLODED. – Free Online Library". Thefreelibrary.com. Retrieved 15 October 2015. ↑ "Clipper Maid of the Seas: Remembering those on flight 103". panamair.org. 2007. Archived frae the oreeginal on 26 March 2008. Retrieved 8 June 2008. This page wis last eeditit on 4 Februar 2018, at 17:21.